By appointment only. 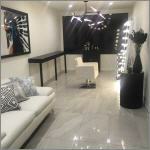 Home Salon Location - Warrandyte. Thank you .. My hair looks amazing and the after care tips you have just sent me are very much appreciated. The service you provide and the results have won me over...thank you so much." WELCOME TO YOUR SALON !